TVFox, a new "super" antenna that can pick up over-the-air TV signals no other antenna was able to pick up before? Netflix has come under fire after tweeting about its customers’ viewing habits. The Netflix US Twitter account this week revealed that 53 people have watched A Christmas Prince every day for the past 18 days. The tweet was intended to be light-hearted and humorous, but has been described as "creepy" by some users and kicked off a debate around how closely the company is watching its customers, and what it can and cannot do with the data it has on individual users. You won't beelieve how much some people love Bee Movie. One person is such a fan that, according to Netflix, they saw it 357 times in a single year. 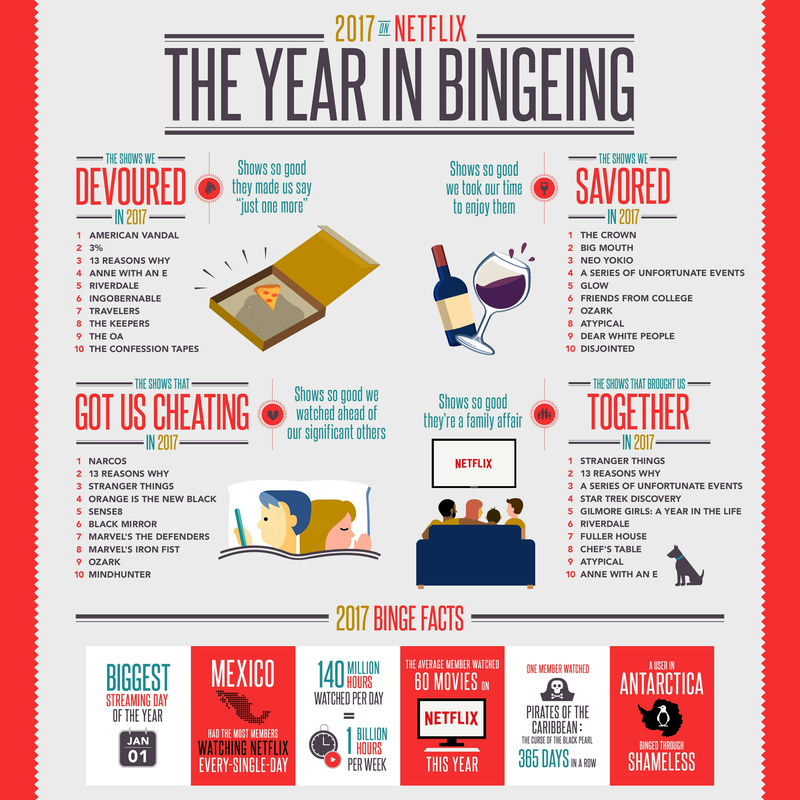 That standout statistic comes from Netflix's annual "Year in Review" report (via Business Insider), which looks at viewership data compiled between November 1, 2016 and November 1, 2017. The streaming service doesn't say whether this UK-based subscriber spread out their Bee Movie love, viewing it about once per day, or just binged it for three and a half weeks straight. The point that Netflix is not-so-subtly trying to make...is that you don't need the theater to get the blockbuster experience. "Bright" isn't the first Netflix film to star an A-lister. Among other projects, Brad Pitt's "War Machine" arrived on the streaming service earlier this year. But "Bright" is Netflix's first original film to fit the Hollywood blockbuster archetype. It mixes a high-concept premise -- think "Training Day" set in a world where fantastical characters like orcs and elves live among us -- with a household name like Will Smith. It's the kind of big-budget film that could fill theaters. Netflix spent a good chunk of the event talking about its use of visual technology like high dynamic range and Dolby Vision to ensure that its subscribers get the best possible viewing experience. Likewise, it used Dolby Atmos for dynamic sound effects. See what was trending in 2017 around the world. Or in the US. It’s fun to poke around and see what was trending this year all around the world. What TV shows were popular in different countries, etc. It’s a powerful control system for virtually every streaming, cable, and satellite box out there. It’s not just a simple remote, though: you plug everything into the large Caavo unit, and it uses machine vision (what the company is now calling Caavo Vision) to intelligently navigate the interface for all of those boxes behind the scenes. Merry Christmas, HTGuys! I caught up to the David Dicks Speaker Myths episode last week. Now that my wife has retired and moved here from the San Fernando Valley I keep falling behind in my podcast listening. But I've still never missed one! Anyway, he mentioned that the best all-around place to locate a speaker is on the floor. Now, I have been using Hsu Research HB-1 speakers for my mains and they have been pretty darn nice for theater usage and I have them raised about two feet to even up with the Hsu center channel. Very happy with them until I started messing with the internet radio feature on my Marantz 5011; the thin signal gave kind of a hollow sound that I was able to adjust for but placing the speakers on the floor made all the difference for all types of use! Combining this with the info from the KEF guy interview (shout out to Mark Silver, former owner of Northridge Audio who first demo'd KEF's for me in the late 70's!) I deduce that having them on the floor also allows my "media watching sofa" to act more as a sound deadener to reduce reflectivity in the room. Due to the placement of the door/ closet door/ windows in the room I have not been able to try any of his ideas on placing materials on the walls but I believe dropping them to the floor allows the sofa to help out. December 25, 2017 | Rick K.